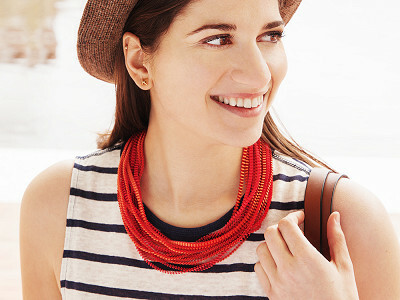 Normally statement necklaces are chunky and heavy. So we were delighted with the fabric statement necklace by Minimum Design. The bold, dimensional designs give off different colors depending on how they catch the light. Crisp, tiny pleats bring each strand to life, giving it movement. The satiny fabric is dual-sided, adding layers of color and shine so that the necklace looks different depending on how you drape it—or what you’re wearing. It hangs beautifully worn long or doubled up. Lighting designer Alexandra Tsoukala is known for creating whimsical, structural shapes out of fabric. Inspired by the ancient Kore sculptures in her native Greece, which feature pleated details, she designed these necklaces. They’re handmade with fabric remnants from her lampshades. Alexandra thinks of her necklaces as movable sculptures, and we agree. Each is a wearable piece of art that will light up your look. Hello Grommet fans! I’m very excited to introduce Greek designer Alexandra Tsoukala and her collection of pleated fabric necklaces, where modern fashion meets ancient Greek chic. Alexandra is known for her distinct yet practical sense of style. She loves working with fabrics, textiles and various metals to produce handmade light sculptures, furniture, jewelry and casual fashion items. I am Katerina and I will be very happy to answer any questions you might have regarding the necklaces as well as Alexandra’s work. Can I request specific color combinations? @Barb Hi Barb! Alexandra does not usually do customised requests I'm afraid, but there is a good variety to accommodate different tastes and clothes. As Alexandra produces necklaces with other colour combinations as well, feel free to contact The Grommet about them. I live in South Florida and I am con erred about the necklace getting soiled from perspiration. Can it be washed or dry cleaned? @Dia8 Hi Dia! Not to worry, the necklaces are not spoilt by perspiration. We recommend you wash them gently by hand, with cold water and some hand soap. When it comes to drying, you can either hang them or preferably spread them out on a towel. They dry very quickly because they are made of satin polyester. Is there any metal that would touch the neck? I am alergic to alot of metals. @Joyce Hi Joyce! No there is no metal, it is all satin polyester. So as long as you are tolerant to that, you shouldn't have any problems. Will the pleats eventually be straightened out with wear and washing or will they hold their shape? @Sheryl Hi Sheryl! The pleats are made to last - we haven't had any reports of the necklaces losing their shape so far. Just remember to wash them gently, with cold water, and definitely not iron them. @Boubex Hi Boubex! Necklaces only come in one size (dimensions are 22" x 3" x 0.5"). But, due to the flexibility of the fabric, you have the option of either wearing them full-length or shortening them by half, which is actually something that many of our customers choose to do. @Gloria Hi Gloria! Each necklace is made up of eight pleated fabric strands. How many strands come in an order? @Kurt Hi Kurt! If you order one necklace, then it's eight strands. 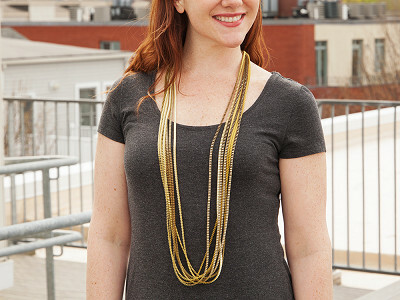 All necklaces are made by eight satin polyester strands, tied together. Is it possible to untie and separate the 8 strands? @Kathryn Hi Kathryn! The strands are glued together. Trying to separate them will unfortunately ruin the necklace, as you won't be able to tie them together again. @Katerina I wonder if the colors will run or transfer if I wear a light colored top and I perspire? Also, how is a 22" necklace able to be doubled? That would make the necklace 11" long. Or am I figuring it wrong? Thank you.